I made the above graphic back in 2008 to celebrate the 25th anniversary of the return of Copenhagen's separated cycle tracks. Now it's 31 years on, but the anniversary is timeless. 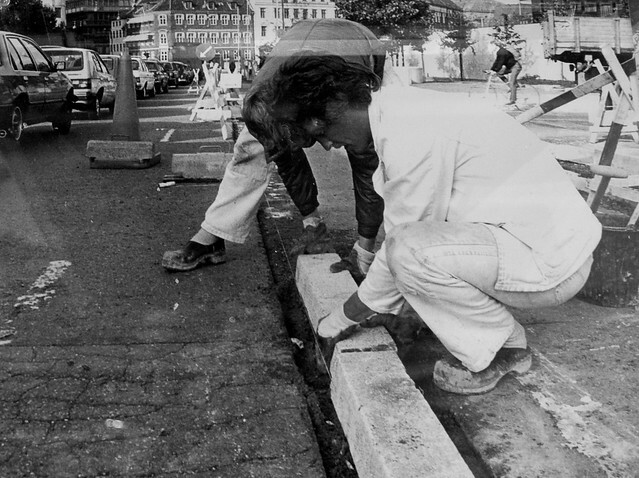 It was in June 1983 that the Copenhagen cycle track returned to Copenhagen. Meaning cycle tracks separated from cars on one side and pedestrians on the other by curbs. For the record, there were cycle tracks prior to this. 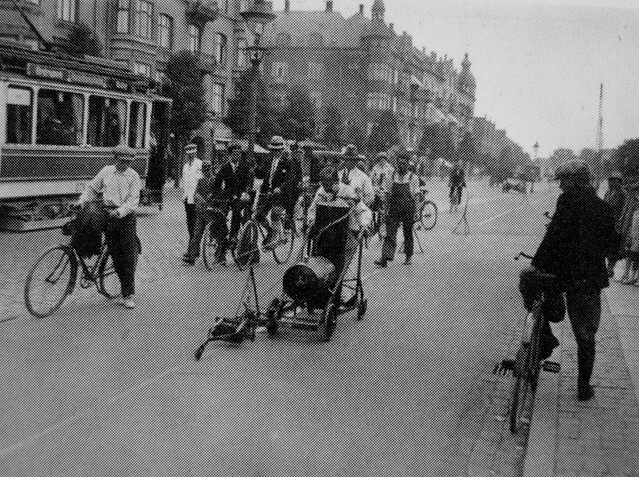 Historically, separated cycle tracks criss-crossed Copenhagen but many were removed during the brain fart that was the 50s and 60s where planners decided the car was a good horse to back. Here are the first bike lanes being marked out back in... 1915. 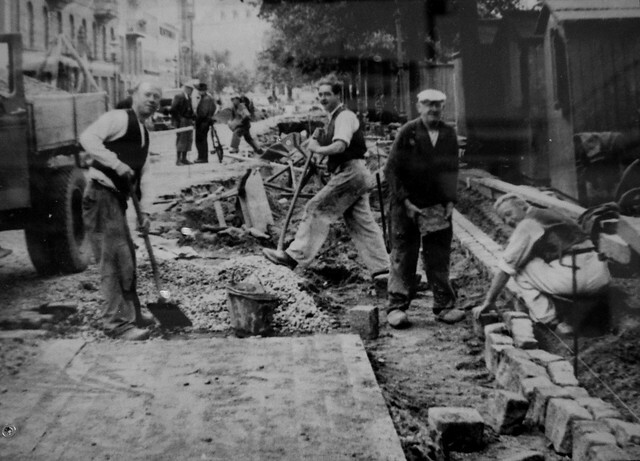 Here is a cycle track being constructed back in ... 1930. But the return of the physically-separated cycle track in the modern era is a landmark. The City of Copenhagen made a visonary choice in implementing them. Cycling levels plummeted through the 50s and 60s from a peak in the late 1940s. By the late 60s, the modal share hit 9% after a high of 55%. Due... you guessed it... to infrastructure being removed to make space for cars. Through the 1970s, the focus returned to the bicycle as a solution to transport problems. In 1983, the foundation was laid - in stone - for a return to rationality. Jens Kramer Mikkelsen, head of the traffic department (and later Lord Mayor) was responsible for the paradigm shift. A shift which continued unabated until today, where 41% of people arriving in the City of Copenhagen at work or education do so on bicycles. Of the citizens of Copenhagen municipality, the number is 55% who cycle every day. Only 12% drive cars. On June 4, 1983 the Danish Cyclists' Union, at a large bicycle demonstration, gave a "Cyclist Award" to Mikkelsen in the form of a two metre long curb to symbolise the physical separation from traffic. The cycle track was placed on the bike lane on Amagerbrogade at the corner of Hollænderdybet - just after Amagerboulevard - a sacred shrine for bike culture if anyone wants to start a'pilgrimage-ing. 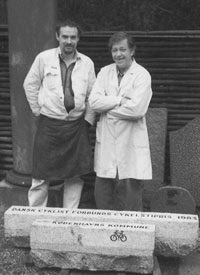 The photo features the Cyclist Award and the two chaps who made it - stone mason Uffe Mohr [right] and his apprentice Egon Albertsen [left].